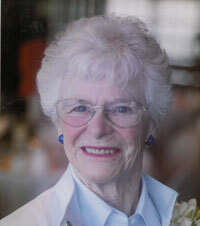 Sally Skinner Behnke was a leader in the Seattle community and a woman generous with both her time and means. She left us on Dec. 12, 2013, following complications from a stroke. She was 90 years young. Sally was born Sept. 21, 1923, in Seattle, Wash., the daughter of Gilbert and Winifred Skinner. She was second of three children. Sally attended St. Nicholas High School. She matriculated to Sweetbriar College in Virginia for two years and then returned to Seattle at the start of World War II where she graduated from the University of Washington in 1944 with a Bachelor of Science degree. Sally and Robert (Bob) Behnke were married shortly after her graduation. Together the Behnkes raised three sons in Medina, Wash., where Bob served as mayor during the 1960s. Sally had a deep commitment to community service and gave generously of both her time and talents. She followed in the footsteps of both her grandmother and her mother, joining the board of Seattle’s Children’s Orthopedic Hospital (now Seattle Children’s). In 1945, Sally helped establish the Olive Kerry Guild at Seattle Children’s. She would later become the hospital’s chairman of the board and lead one of the largest capital campaigns in the organization’s history. For her service, Sally was honored with the Penington Award, the highest award bestowed by Children’s Hospital. When Sally’s son Ned was diagnosed with a profound hearing loss, she became deeply involved with the Northwest School for Hearing Impaired Children. She would become both a founding board member and president of the school’s board. Sally was also involved with Ned’s alma mater, the Rochester Institute of Technology, where he received his MFA in painting. She was also supportive of the Hearing, Speech and Deafness Center, ultimately founding the Ned Behnke Preschool at the center. Sally was a lifelong supporter of the University of Washington, serving as chair of the Development Fund board, member of the Tyee Board and the UW Foundation board, as well as serving on various committees and boards connected with Intercollegiate Athletics and the School of Medicine, in addition to being a member of the UW President’s Club. The UW Alumni Association showed its appreciation in 2010 by honoring Sally and Bob, with Bob’s brother John F. Behnke, with the prestigious Gates Volunteer Service Award recognizing outstanding volunteer leadership to the university. Sally was a woman of many “firsts,” serving as the first woman on the board of Washington Mutual bank and as the first chairwoman of the Corporate Council for the Arts (now Artsfund). Sally served as a member of the board of trustees of the Fred Hutchinson Cancer Research center, taking an active leadership role with their capital campaigns, a role for which she was honored with the Grace Hefferman Arnold Guild Award for Outstanding Service to Fred Hutchinson Cancer Research Center. Sally was also an active fundraiser for the Northwest Aids Foundation (now Lifelong AIDS Alliance) and The Nature Conservancy, as well as serving as a board member. For her extraordinary dedication to her community, Sally was honored in 2001 with the Isabel Coleman Award for Excellence in Community Service, a prestigious award given by the YWCA of Seattle-King County-Snohomish County reserved for “an individual or organization whose efforts have contributed to enhancing the quality of life in the community.” This was one of many honors Sally received during her lifetime. Sally was a passionate sports fan, supporting our local Seattle teams as well as serving as a board member of the Seattle Super Sonics. She shared this passion for sports with her husband as well as her sons. Sally was a loyal Washington Huskies fan and could often be seen at both Husky football and basketball games in her purple sequin hat. In November 1962, Sally and Bob found themselves in a full spread Sports Illustrated article describing their commute by boat to Husky football games. Horses were a large part of Sally’s life. Sally didn’t own a horse until after she was married with children when Bob encouraged her by saying, “You’ve always wanted a horse, and you’re not getting any younger. You’d better get out and get one.” Sally admired the skill and precision that was required for jumping. She would belong to the American Horse Show Association and rode in horse shows until she was in her early 70s. Bob and Sally considered Sun Valley their second home and enjoyed all that it had to offer in both winter and summer. Each year, the Behnkes hosted the annual kickoff party for the Ancient Skiers. Sally is survived by her sons, Carl G. Behnke (Renee) and John S. Behnke (Shari); grandchildren, Marisa Behnke (Corey Ginsberg), Zane Behnke (Alison), Merrill Behnke (Ryan Broms) and Drew Behnke (Chloe); great-grandchildren, Quinn, Channing, Weston and Logan; and sister, Nancy Nordhoff (Lynn Hays). Sally was predeceased by her husband, Robert Joseph Behnke, her son, Robert Edward (Ned) Behnke, and her brother, David Edward Skinner II. A memorial service will be held January 10, 2014, at 2 p.m. at St. Mark’s Cathedral, Seattle. A reception will follow at the Sunset Club, Seattle. Sally’s family wishes to thank all nurses who cared for her during her last few months: Sally Muchai, Lily Saini, Cedar Hyde, Sheila Pascua and Linda Nygard. In lieu of flowers, donations in Sally’s memory may be made to Seattle Cancer Care Alliance.